I bought all the stuff today to try these! I think if you made them taste great with all the changes they would be FANTASTIC for round 2 with the Hello Kitty's. While checking out at winco....with almond bark, the cashier asked me if I knew they sold the candy coating chips in the bulk bins? UM.....no I didn't. So thats gonna be on my list in 6 months when I make it out there again. I hardly ever follow a recipe exactly. sometimes it works out great and sometimes not, but either way I know it's mostly my creation. Allrecipes has a great substitution list for just about every thing you might need. 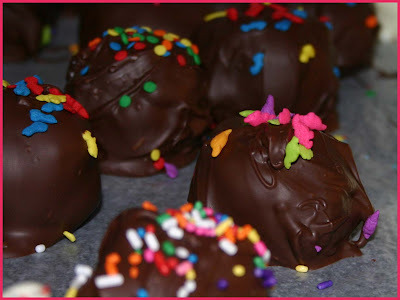 The cake balls look really good, in a dessert that matters almost as much as the taste... too sweet is not a bad thing! Sorry to barge right in. I am starting a new social website called www.wascotopia.com. I was searching blogs for mentions of Wasco and found one on yours. Since you like to blog and seem to know folks in Wasco please visit the new site and join up if you are so inclined. We can always use new bloggers. I just felt inclined to let you know I am a blog stalker of yours. You crack me up, and I love to read your funny stories! I can truly relate to you with my own crazy bunch. I actually grew up with your husband and SIL, and I know your sister Kendra and we have a few of the same friends. I stumbled across your blog awhile ago, and I just wanted to let you know how much I enjoy the way you write and do things! I love that you do it your way...I do too! Makes life interesting! They look yummy...looks like I need to go to the store!